'Light-bulb moment' ink sketch by Beatle John Lennon could sell for more than £10,000 in online auction. Beatles Radio: The Beatles, Solos, Covers, Birthdays, News The Fab 4 and More! An ink sketch by Beatle John Lennon - drawn in a 'light-bulb moment' - is expected to sell for thousands of pounds in an online auction next month. The drawing has officially been valued at between £6,000 and £10,000, but an expert has said previous artistic works by Lennon have sold for £100,000 and that this offering could 'go through the roof'. 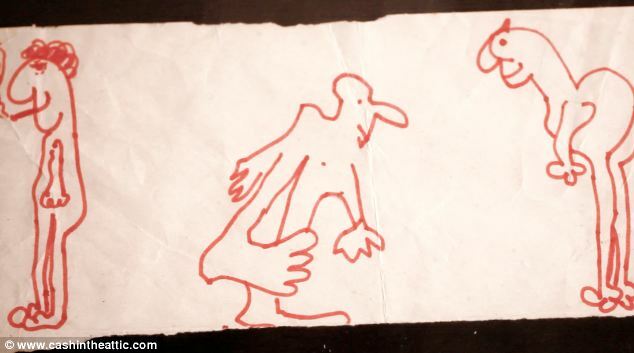 The double-sided doodle, which features surreal characters in red ink on both sides of a piece of paper, measuring five inches by ten, was hand-drawn by the late musician in 1964. Music memorabilia expert Ted Owen said: ‘What’s lovely about it is he’s obviously been sitting down at the dinner table or out to dinner somewhere, picked up a piece of paper and had an idea. ‘It’s the lightbulb moment. This took him into a whole different genre of being an artist.’ The front of the paper features three characters, including one smoking a cigarette. The reverse side has varying forms of head and face shapes. Similar characters appeared in Lennon’s book, In His Own Right, which was produced in 1964.